The reticular formation is a set of interconnected nuclei that are located throughout the brainstem. The reticular formation is not anatomically well defined because it includes neurons located in different parts of the brain. The neurons of the reticular formation make up a complex set of networks in the core of the brainstem that extend from the upper part of the midbrain to the lower part of the medulla oblongata. The reticular formation includes ascending pathways to the cortex in the ascending reticular activating system (ARAS) and descending pathways to the spinal cord via the reticulospinal tracts of the descending reticular formation. Neurons of the reticular formation, particularly those of the ascending reticular activating system, play a crucial role in maintaining behavioral arousal and consciousness. The functions of the reticular formation are modulatory and premotor. The modulatory functions are primarily found in the rostral sector of the reticular formation and the premotor functions are localized in the neurons in more caudal regions. The reticular formation is divided into three columns: raphe nuclei (median), gigantocellular reticular nuclei (medial zone), and parvocellular reticular nuclei (lateral zone). The raphe nuclei are the place of synthesis of the neurotransmitter serotonin, which plays an important role in mood regulation. 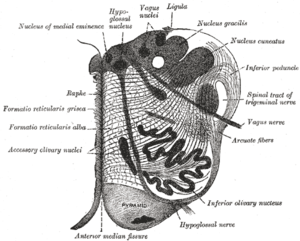 The gigantocellular nuclei are involved in motor coordination. The parvocellular nuclei regulate exhalation. The reticular formation is essential for governing some of the basic functions of higher organisms and is one of the phylogenetically oldest portions of the brain. The human reticular formation is composed of almost 100 brain nuclei and contains many projections into the forebrain, brainstem, and cerebellum, among other regions. It includes the reticular nuclei, reticulothalamic projection fibers, diffuse thalamocortical projections, ascending cholinergic projections, descending non-cholinergic projections, and descending reticulospinal projections. The reticular formation also contains two major neural subsystems, the ascending reticular activating system and descending reticulospinal tracts, which mediate distinct cognitive and physiological processes. It has been functionally cleaved both sagittally and coronally. The original functional differentiation was a division of caudal and rostral. This was based upon the observation that the lesioning of the rostral reticular formation induces a hypersomnia in the cat brain. In contrast, lesioning of the more caudal portion of the reticular formation produces insomnia in cats. This study has led to the idea that the caudal portion inhibits the rostral portion of the reticular formation. Sagittal division reveals more morphological distinctions. The raphe nuclei form a ridge in the middle of the reticular formation, and, directly to its periphery, there is a division called the medial reticular formation. The medial RF is large and has long ascending and descending fibers, and is surrounded by the lateral reticular formation. The lateral RF is close to the motor nuclei of the cranial nerves, and mostly mediates their function. The medial reticular formation and lateral reticular formation are two columns of nuclei with ill-defined boundaries that send projections through the medulla and into the midbrain. The nuclei can be differentiated by function, cell type, and projections of efferent or afferent nerves. Moving caudally from the rostral midbrain, at the site of the rostral pons and the midbrain, the medial RF becomes less prominent, and the lateral RF becomes more prominent. Existing on the sides of the medial reticular formation is its lateral cousin, which is particularly pronounced in the rostral medulla and caudal pons. Out from this area spring the cranial nerves, including the very important vagus nerve. The lateral RF is known for its ganglions and areas of interneurons around the cranial nerves, which serve to mediate their characteristic reflexes and functions. Somatic motor control – Some motor neurons send their axons to the reticular formation nuclei, giving rise to the reticulospinal tracts of the spinal cord. These tracts function in maintaining tone, balance, and posture—especially during body movements. The reticular formation also relays eye and ear signals to the cerebellum so that the cerebellum can integrate visual, auditory, and vestibular stimuli in motor coordination. Other motor nuclei include gaze centers, which enable the eyes to track and fixate objects, and central pattern generators, which produce rhythmic signals of breathing with swallowing, and with defecation and urination. Cardiovascular control – The reticular formation includes the cardiac and vasomotor centers of the medulla oblongata. Pain modulation – The reticular formation is one means by which pain signals from the lower body reach the cerebral cortex. It is also the origin of the descending analgesic pathways. The nerve fibers in these pathways act in the spinal cord to block the transmission of some pain signals to the brain. Sleep and consciousness – The reticular formation has projections to the thalamus and cerebral cortex that allow it to exert some control over which sensory signals reach the cerebrum and come to our conscious attention. It plays a central role in states of consciousness like alertness and sleep. Injury to the reticular formation can result in irreversible coma. Habituation – This is a process in which the brain learns to ignore repetitive, meaningless stimuli while remaining sensitive to others. A good example of this is a person who can sleep through loud traffic in a large city, but is awakened promptly due to the sound of an alarm or crying baby. Reticular formation nuclei that modulate activity of the cerebral cortex are part of the ascending reticular activating system. Ascending reticular activating system. Reticular formation labeled near center. The ascending reticular activating system (ARAS), also known as the extrathalamic control modulatory system or simply the reticular activating system (RAS), is a set of connected nuclei in the brains of vertebrates that is responsible for regulating wakefulness and sleep-wake transitions. The ARAS is a part of the reticular formation and is mostly composed of various nuclei in the thalamus and a number of dopaminergic, noradrenergic, serotonergic, histaminergic, cholinergic, and glutamatergic brain nuclei. The ARAS is composed of several neural circuits connecting the dorsal part of the posterior midbrain and anterior pons to the cerebral cortex via distinct pathways that project through the thalamus and hypothalamus. The ARAS is a collection of different nuclei – more than 20 on each side in the upper brainstem, the pons, medulla, and posterior hypothalamus. The neurotransmitters that these neurons release include dopamine, norepinephrine, serotonin, histamine, acetylcholine, and glutamate. They exert cortical influence through direct axonal projections and indirect projections through thalamic relays. The thalamic pathway consists primarily of cholinergic neurons in the pontine tegmentum, whereas the hypothalamic pathway is composed primarily of neurons that release monoamine neurotransmitters, namely dopamine, norepinephrine, serotonin, and histamine. The glutamate-releasing neurons in the ARAS were identified much more recently relative to the monoaminergic and cholinergic nuclei; the glutamatergic component of the ARAS includes one glutamatergic nucleus in the hypothalamus and various glutamatergic brainstem nuclei. The orexin neurons of the lateral hypothalamus innervate every component of the ascending reticular activating system and coordinate activity within the entire system. The key components of the ARAS are listed in the table below. The ARAS consists of evolutionarily ancient areas of the brain, which are crucial to survival and protected during adverse periods. As a result, the ARAS still functions during inhibitory periods of hypnosis. The ascending reticular activating system which sends neuromodulatory projections to the cortex - mainly connects to the prefrontal cortex. There is seen to be low connectivity to the motor areas of the cortex. The ascending reticular activating system is an important enabling factor for the state of consciousness. The ascending system is seen to contribute to wakefulness as characterised by cortical and behavioural arousal. The main function of the ARAS is to modify and potentiate thalamic and cortical function such that electroencephalogram (EEG) desynchronization ensues. There are distinct differences in the brain's electrical activity during periods of wakefulness and sleep: Low voltage fast burst brain waves (EEG desynchronization) are associated with wakefulness and REM sleep (which are electrophysiologically similar); high voltage slow waves are found during non-REM sleep. Generally speaking, when thalamic relay neurons are in burst mode the EEG is synchronized and when they are in tonic mode it is desynchronized. Stimulation of the ARAS produces EEG desynchronization by suppressing slow cortical waves (0.3–1 Hz), delta waves (1–4 Hz), and spindle wave oscillations (11–14 Hz) and by promoting gamma band (20 – 40 Hz) oscillations. The physiological change from a state of deep sleep to wakefulness is reversible and mediated by the ARAS. Inhibitory influence from the brain is active at sleep onset, likely coming from the preoptic area (POA) of the hypothalamus. During sleep, neurons in the ARAS will have a much lower firing rate; conversely, they will have a higher activity level during the waking state. Therefore, low frequency inputs (during sleep) from the ARAS to the POA neurons result in an excitatory influence and higher activity levels (awake) will have inhibitory influence. In order that the brain may sleep, there must be a reduction in ascending afferent activity reaching the cortex by suppression of the ARAS. The ARAS also helps mediate transitions from relaxed wakefulness to periods of high attention. There is increased regional blood flow (presumably indicating an increased measure of neuronal activity) in the midbrain reticular formation (MRF) and thalamic intralaminar nuclei during tasks requiring increased alertness and attention. Mass lesions in brainstem ARAS nuclei can cause severe alterations in level of consciousness (e.g., coma). Bilateral damage to the reticular formation of the midbrain may lead to coma or death. Direct electrical stimulation of the ARAS produces pain responses in cats and educes verbal reports of pain in humans. Additionally, ascending reticular activation in cats can produce mydriasis, which can result from prolonged pain. These results suggest some relationship between ARAS circuits and physiological pain pathways. Narcolepsy: Lesions along the PPT/LDT nuclei are associated with narcolepsy. There is a significant down-regulation of PPN output and a loss of orexin peptides, promoting the excessive daytime sleepiness that is characteristic of this disorder. Schizophrenia: Intractable schizophrenic patients have a significant increase (> 60%) in the number of PPN neurons and dysfunction of NO signaling involved in modulating cholinergic output of the ARAS. Post-traumatic stress disorder, Parkinson's disease, REM behavior disorder: Patients with these syndromes exhibit a significant (>50%) decrease in the number of locus coeruleus (LC) neurons, resulting is increased disinhibition of the PPN. Progressive supranuclear palsy (PSP): Dysfunction of NO signaling has been implicated in the development of PSP. Depression, autism, Alzheimer's disease, attention deficit disorder: The exact role of the ARAS in each of these disorders has not yet been identified. However, it is expected that in any neurological or psychiatric disease that manifests disturbances in arousal and sleep-wake cycle regulation, there will be a corresponding dysregulation of some elements of the ARAS. Parkinson's disease: REM sleep disturbances are common in Parkinson's. It is mainly a dopaminergic disease, but cholinergic nuclei are depleted as well. Degeneration in the ARAS begins early in the disease process. Preterm birth: Regardless of birth weight or weeks of gestation, premature birth induces persistent deleterious effects on pre-attentional (arousal and sleep-wake abnormalities), attentional (reaction time and sensory gating), and cortical mechanisms throughout development. Smoking during pregnancy: Prenatal exposure to cigarette smoke is known to produce lasting arousal, attentional and cognitive deficits in humans. This exposure can induce up-regulation of nicotinic receptors on α4b2 subunit on Pedunculopontine nucleus (PPN) cells, resulting in increased tonic activity, resting membrane potential, and hyperpolarization-activated cation current. These major disturbances of the intrinsic membrane properties of PPN neurons result in increased levels of arousal and sensory gating deficits (demonstrated by a diminished amount of habituation to repeated auditory stimuli). It is hypothesized that these physiological changes may intensify attentional dysregulation later in life. Spinal cord tracts - reticulospinal tract labeled in red, near-center at left in figure. The reticulospinal tracts, also known as the descending or anterior reticulospinal tracts, are extrapyramidal motor tracts that descend from the reticular formation in two tracts to act on the motor neurons supplying the trunk and proximal limb flexors and extensors. The reticulospinal tracts are involved mainly in locomotion and postural control, although they do have other functions as well. The descending reticulospinal tracts are one of four major cortical pathways to the spinal cord for musculoskeletal activity. The reticulospinal tracts works with the other three pathways to give a coordinated control of movement, including delicate manipulations. The four pathways can be grouped into two main system pathways – a medial system and a lateral system. The medial system includes the reticulospinal pathway and the vestibulospinal pathway, and this system provides control of posture. The corticospinal and the rubrospinal tract pathways belong to the lateral system which provides fine control of movement. The tract is divided into two parts, the medial (or pontine) and lateral (or medullary) reticulospinal tracts (MRST and LRST). The MRST is responsible for exciting anti-gravity, extensor muscles. The fibers of this tract arise from the caudal pontine reticular nucleus and the oral pontine reticular nucleus and project to lamina VII and lamina VIII of the spinal cord. The LRST is responsible for inhibiting excitatory axial extensor muscles of movement. It is also responsible for automatic breathing. The fibers of this tract arise from the medullary reticular formation, mostly from the gigantocellular nucleus, and descend the length of the spinal cord in the anterior part of the lateral column. The tract terminates in lamina VII mostly with some fibers terminating in lamina IX of the spinal cord. The ascending sensory tract conveying information in the opposite direction is known as the spinoreticular tract. Influences blood flow to lateral geniculate nucleus of the thalamus. The reticulospinal tracts are mostly inhibited by the corticospinal tract; if damage occurs at the level of or below the red nucleus (e.g. to the superior colliculus), it is called decerebration, and causes decerebrate rigidity: an unopposed extension of the head and limbs. The reticulospinal tracts also provide a pathway by which the hypothalamus can control sympathetic thoracolumbar outflow and parasympathetic sacral outflow. The term "reticular formation" was coined in the late 19th century by Otto Deiters, coinciding with Ramon y Cajal’s neuron doctrine. Allan Hobson states in his book The Reticular Formation Revisited that the name is an etymological vestige from the fallen era of the aggregate field theory in the neural sciences. The term "reticulum" means "netlike structure", which is what the reticular formation resembles at first glance. It has been described as being either too complex to study or an undifferentiated part of the brain with no organization at all. Eric Kandel describes the reticular formation as being organized in a similar manner to the intermediate gray matter of the spinal cord. This chaotic, loose, and intricate form of organization is what has turned off many researchers from looking farther into this particular area of the brain. The cells lack clear ganglionic boundaries, but do have clear functional organizations and distinct cell types. The term "reticular formation" is seldom used anymore except to speak in generalities. Modern scientists usually refer to the individual nuclei that compose the reticular formation. Moruzzi and Magoun first investigated the neural components regulating the brain's sleep-wake mechanisms in 1949. Physiologists had proposed that some structure deep within the brain controlled mental wakefulness and alertness. It had been thought that wakefulness depended only on the direct reception of afferent (sensory) stimuli at the cerebral cortex. The direct electrical stimulation of the brain could simulate electrocortical relays. Magoun used this principle to demonstrate, on two separate areas of the brainstem of a cat, how to produce wakefulness from sleep. First the ascending somatic and auditory paths; second, a series of "ascending relays from the reticular formation of the lower brain stem through the midbrain tegmentum, subthalamus and hypothalamus to the internal capsule." The latter was of particular interest, as this series of relays did not correspond to any known anatomical pathways for the wakefulness signal transduction and was coined the ascending reticular activating system (ARAS). Next, the significance of this newly identified relay system was evaluated by placing lesions in the medial and lateral portions of the front of the midbrain. Cats with mesancephalic interruptions to the ARAS entered into a deep sleep and displayed corresponding brain waves. In alternative fashion, cats with similarly placed interruptions to ascending auditory and somatic pathways exhibited normal sleeping and wakefulness, and could be awakened with somatic stimuli. Because these external stimuli would be blocked by the interruptions, this indicated that the ascending transmission must travel through the newly discovered ARAS. Finally, Magoun recorded potentials within the medial portion of the brain stem and discovered that auditory stimuli directly fired portions of the reticular activating system. Furthermore, single-shock stimulation of the sciatic nerve also activated the medial reticular formation, hypothalamus, and thalamus. Excitation of the ARAS did not depend on further signal propagation through the cerebellar circuits, as the same results were obtained following decerebellation and decortication. The researchers proposed that a column of cells surrounding the midbrain reticular formation received input from all the ascending tracts of the brain stem and relayed these afferents to the cortex and therefore regulated wakefulness. ^ Purves, Dale (2011). Neuroscience (5. ed.). Sunderland, Mass. : Sinauer. pp. 390–395. ISBN 978-0-87893-695-3. ^ a b c d e f g h i j k l m n Iwańczuk W, Guźniczak P (2015). "Neurophysiological foundations of sleep, arousal, awareness and consciousness phenomena. Part 1". Anaesthesiol Intensive Ther. 47 (2): 162–167. doi:10.5603/AIT.2015.0015. PMID 25940332. The ascending reticular activating system (ARAS) is responsible for a sustained wakefulness state. It receives information from sensory receptors of various modalities, transmitted through spinoreticular pathways and cranial nerves (trigeminal nerve — polymodal pathways, olfactory nerve, optic nerve and vestibulocochlear nerve — monomodal pathways). These pathways reach the thalamus directly or indirectly via the medial column of reticular formation nuclei (magnocellular nuclei and reticular nuclei of pontine tegmentum). The reticular activating system begins in the dorsal part of the posterior midbrain and anterior pons, continues into the diencephalon, and then divides into two parts reaching the thalamus and hypothalamus, which then project into the cerebral cortex (Fig. 1). The thalamic projection is dominated by cholinergic neurons originating from the pedunculopontine tegmental nucleus of pons and midbrain (PPT) and laterodorsal tegmental nucleus of pons and midbrain (LDT) nuclei [17, 18]. The hypothalamic projection involves noradrenergic neurons of the locus coeruleus (LC) and serotoninergic neurons of the dorsal and median raphe nuclei (DR), which pass through the lateral hypothalamus and reach axons of the histaminergic tubero-mamillary nucleus (TMN), together forming a pathway extending into the forebrain, cortex and hippocampus. Cortical arousal also takes advantage of dopaminergic neurons of the substantia nigra (SN), ventral tegmenti area (VTA) and the periaqueductal grey area (PAG). Fewer cholinergic neurons of the pons and midbrain send projections to the forebrain along the ventral pathway, bypassing the thalamus [19, 20]. ^ a b c d Augustine JR (2016). "Chapter 9: The Reticular Formation". Human Neuroanatomy (2nd ed.). John Wiley & Sons. pp. 141–153. ISBN 9781119073994. Archived from the original on 4 May 2018. Retrieved 4 September 2017. ^ "the definition of reticular activating system". Dictionary.com. Archived from the original on 2017-02-05. ^ a b Jones, BE (2008). "Modulation of cortical activation and behavioral arousal by cholinergic and orexinergic systems". Annals of the New York Academy of Sciences. 1129 (1): 26–34. Bibcode:2008NYASA1129...26J. doi:10.1196/annals.1417.026. PMID 18591466. ^ "The Brain From Top To Bottom". Thebrain.mcgill.ca. Archived from the original on 2016-04-23. Retrieved 2016-04-28. ^ "The Benefits of Midbrain Activation". 2014-09-15. Archived from the original on 2017-09-30. Retrieved 2017-07-05. ^ "Anatomy of the Brain - Reticular Formation". Biology.about.com. 2015-07-07. Archived from the original on 2003-04-14. Retrieved 2016-04-28. ^ Saladin, Kenneth S. Anatomy & Physiology the Unity of Form and Function. Dubuque: McGraw-Hill, 2009. Print. ^ a b c d e f g Malenka RC, Nestler EJ, Hyman SE (2009). "Chapter 12: Sleep and Arousal". In Sydor A, Brown RY (eds.). Molecular Neuropharmacology: A Foundation for Clinical Neuroscience (2nd ed.). New York, USA: McGraw-Hill Medical. p. 295. ISBN 9780071481274. The RAS is a complex structure consisting of several different circuits including the four monoaminergic pathways ... The norepinephrine pathway originates from the locus ceruleus (LC) and related brainstem nuclei; the serotonergic neurons originate from the raphe nuclei within the brainstem as well; the dopaminergic neurons originate in ventral tegmental area (VTA); and the histaminergic pathway originates from neurons in the tuberomammillary nucleus (TMN) of the posterior hypothalamus. As discussed in Chapter 6, these neurons project widely throughout the brain from restricted collections of cell bodies. Norepinephrine, serotonin, dopamine, and histamine have complex modulatory functions and, in general, promote wakefulness. The PT in the brain stem is also an important component of the ARAS. Activity of PT cholinergic neurons (REM-on cells) promotes REM sleep. During waking, REM-on cells are inhibited by a subset of ARAS norepinephrine and serotonin neurons called REM-off cells. ^ a b Squire L (2013). Fundamental neuroscience (4th ed.). Amsterdam: Elsevier/Academic Press. p. 1095. ISBN 978-0-12-385-870-2. ^ a b Pedersen NP, Ferrari L, Venner A, Wang JL, Abbott SG, Vujovic N, Arrigoni E, Saper CB, Fuller PM (November 2017). "Supramammillary glutamate neurons are a key node of the arousal system". Nature Communications. 8 (1): 1405. Bibcode:2017NatCo...8.1405P. doi:10.1038/s41467-017-01004-6. PMC 5680228. PMID 29123082. Basic and clinical observations suggest that the caudal hypothalamus comprises a key node of the ascending arousal system, but the cell types underlying this are not fully understood. Here we report that glutamate-releasing neurons of the supramammillary region (SuMvglut2) produce sustained behavioral and EEG arousal when chemogenetically activated. ^ a b c Burlet S, Tyler CJ, Leonard CS (April 2002). "Direct and indirect excitation of laterodorsal tegmental neurons by Hypocretin/Orexin peptides: implications for wakefulness and narcolepsy". J. Neurosci. 22 (7): 2862–72. doi:10.1523/JNEUROSCI.22-07-02862.2002. PMID 11923451. ^ Malenka RC, Nestler EJ, Hyman SE (2009). "Chapter 12: Sleep and Arousal". In Sydor A, Brown RY (eds.). Molecular Neuropharmacology: A Foundation for Clinical Neuroscience (2nd ed.). New York, USA: McGraw-Hill Medical. p. 295. ISBN 9780071481274. Orexin neurons are located in the lateral hypothalamus. They are organized in a widely projecting manner, much like the monoamines (Chapter 6), and innervate all of the components of the ARAS. They excite the REM-off monoaminergic neurons during wakefulness and the PT cholinergic neurons during REM sleep. They are inhibited by the VLPO neurons during NREM sleep. ^ Fuller PM, Fuller P, Sherman D, Pedersen NP, Saper CB, Lu J (April 2011). "Reassessment of the structural basis of the ascending arousal system". The Journal of Comparative Neurology. 519 (5): 933–956. doi:10.1002/cne.22559. PMC 3119596. PMID 21280045. ^ Svorad D (January 1957). "Reticular activating system of brain stem and animal hypnosis". Science. 125 (3239): 156. Bibcode:1957Sci...125..156S. doi:10.1126/science.125.3239.156. PMID 13390978. ^ a b Jang SH, Kwon HG (October 2015). "The direct pathway from the brainstem reticular formation to the cerebral cortex in the ascending reticular activating system: A diffusion tensor imaging study". Neurosci. Lett. 606: 200–3. doi:10.1016/j.neulet.2015.09.004. PMID 26363340. ^ a b Steriade, M. (1996). "Arousal: Revisiting the reticular activating system". Science. 272 (5259): 225–226. Bibcode:1996Sci...272..225S. doi:10.1126/science.272.5259.225. PMID 8602506. ^ a b Reiner, P. B. (1995). "Are mesopontine cholinergic neurons either necessary or sufficient components of the ascending reticular activating system?". Seminars in the Neurosciences. 7 (5): 355–359. doi:10.1006/smns.1995.0038. ^ a b c Evans, B.M. (2003). "Sleep, consciousness and the spontaneous and evoked electrical activity of the brain. Is there a cortical integrating mechanism?". Neurophysiologie Clinique. 33 (1): 1–10. doi:10.1016/s0987-7053(03)00002-9. PMID 12711127. ^ Mohan Kumar V, Mallick BN, Chhina GS, Singh B (October 1984). "Influence of ascending reticular activating system on preoptic neuronal activity". Exp. Neurol. 86 (1): 40–52. doi:10.1016/0014-4886(84)90065-7. PMID 6479280. ^ Tindall SC (1990). "Chapter 57: Level of Consciousness". In Walker HK, Hall WD, Hurst JW (eds.). Clinical Methods: The History, Physical, and Laboratory Examinations. Butterworth Publishers. Archived from the original on 2009-01-29. Retrieved 2008-07-04. ^ Ruth RE, Rosenfeld JP (October 1977). "Tonic reticular activating system: relationship to aversive brain stimulation effects". Exp. Neurol. 57 (1): 41–56. doi:10.1016/0014-4886(77)90043-7. PMID 196879. ^ a b c d GarciaRill, E. (1997). "Disorders of the reticular activating system". Medical Hypotheses. 49 (5): 379–387. doi:10.1016/S0306-9877(97)90083-9. PMID 9421802. ^ Robinson, D. (1999). "The technical, neurological and psychological significance of 'alpha', 'delta' and 'theta' waves confounded in EEG evoked potentials: a study of peak latencies". Clinical Neurophysiology. 110 (8): 1427–1434. doi:10.1016/S1388-2457(99)00078-4. PMID 10454278. ^ Garcia-Rill E, Heister DS, Ye M, Charlesworth A, Hayar A (2007). "Electrical coupling: novel mechanism for sleep-wake control". Sleep. 30 (11): 1405–1414. doi:10.1093/sleep/30.11.1405. PMC 2082101. PMID 18041475. ^ a b Schwartz JR, Roth T (December 2008). "Neurophysiology of sleep and wakefulness: basic science and clinical implications". Curr Neuropharmacol. 6 (4): 367–78. doi:10.2174/157015908787386050. PMC 2701283. PMID 19587857. ^ a b Vincent, S. R. (2000). "The ascending reticular activating system - from aminergic neurons to nitric oxide". Journal of Chemical Neuroanatomy. 18 (1–2): 23–30. doi:10.1016/S0891-0618(99)00048-4. PMID 10708916. ^ Hall RW, Huitt TW, Thapa R, Williams DK, Anand KJ, Garcia-Rill E (June 2008). "Long-term deficits of preterm birth: evidence for arousal and attentional disturbances". Clin Neurophysiol. 119 (6): 1281–91. doi:10.1016/j.clinph.2007.12.021. PMC 2670248. PMID 18372212. ^ Garcia-Rill E, Buchanan R, McKeon K, Skinner RD, Wallace T (September 2007). "Smoking during pregnancy: postnatal effects on arousal and attentional brain systems". Neurotoxicology. 28 (5): 915–23. doi:10.1016/j.neuro.2007.01.007. PMC 3320145. PMID 17368773. ^ a b c Squire L (2013). Fundamental neuroscience (4th ed.). Amsterdam: Elsevier/Academic Press. pp. 631–632. ISBN 978-0-12-385-870-2. ^ FitzGerald MT, Gruener G, Mtui E (2012). Clinical Neuroanatomy and Neuroscience. Philadelphia: Saunders Elsevier. p. 192. ISBN 978-0-7020-3738-2. ^ a b Magoun HW (February 1952). "An ascending reticular activating system in the brain stem". AMA Arch Neurol Psychiatry. 67 (2): 145–54, discussion 167–71. doi:10.1001/archneurpsyc.1952.02320140013002. PMID 14893989. Look up reticular formation in Wiktionary, the free dictionary.